As I hike the Florida Trail through the panhandle from west to east, I'm being treated to a rich variety of river personalities. Blackwater was like a silent snake - slithering in the dark, cold and impassive, vaguely threatening. Juniper Creek was a welcoming friend--clear and bright with a sandy bottom and a white sand beach at every bend. Lafayette was straight out of the Hansel & Gretel fairy tale--a place you wouldn't want to get lost in lest you stray around some dark bend and fall into the clutches of a wicked witch. Econfina was frenetic--not bipolar but tripolar--or perhaps it was just quick to age, as it changed personality from spry and sparkling to deeply riven and focused, to expansive and sedate. Sopchoppy was a primeval wonderland, seeming unchanged and untouched since the days of the dinosaur. And now I come to the Aucilla. Here is a river of closely held secrets. Its waters rise in south Georgia, fed by tannin-rich bog lands where it acquires the color of strong tea. When it reaches the Florida Trail it plunges into its own hidden realm beneath the limestone bedrock, disappearing for miles at a time, making a few cameo appearances, and then delving again into its reclusive underworld. What secrets it emerges with it does not tell. The fossil record betrays only a few hints--its caves and underground currents were home to humans during the late ice age when sea levels and water table levels were much lower. 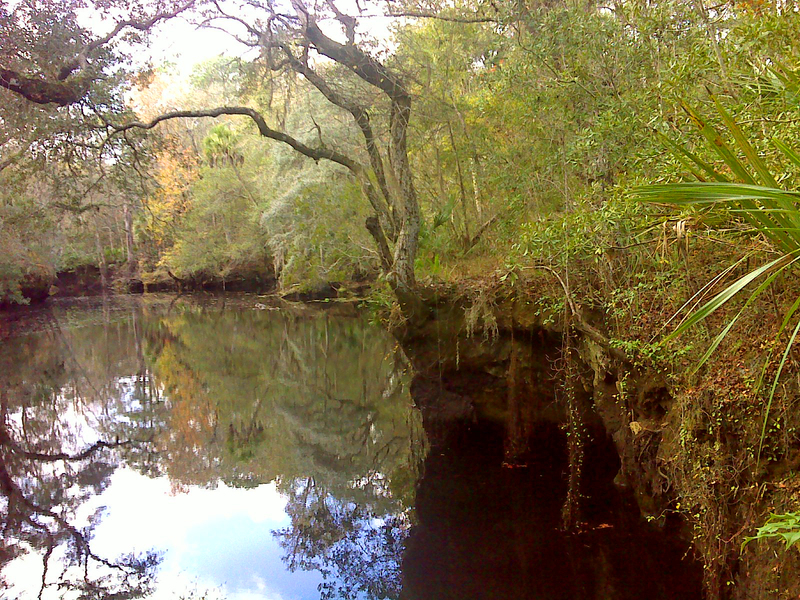 I hiked the Aucilla Sinks section today--a place where the river's dark waters appear as pools, some with visible current, some quiet and seemingly bottomless. It was Christmas Day. The weather was warm, and has been unseasonably so for much of the month of December. Who would think to do leaf peeping during the Christmas holidays? Yes, fall color was at its peak here. And at the same time I saw hints of spring. I found these thistles and violets in bloom, side by side. Yet the Dahoon (a southern holly) was doing its best to uphold the traditions of the season. But the river was the star today. I found photogenic scenes around every bend. I had fun with this one. See if you can tell what I did with this shot. The lily pads help to give it away. Where the trail passed this little hole, I could almost hear it whispering its hidden secrets and beckoning me to delve into its dark realm to discover them. But I resisted the temptation. I had much more of the Aucilla to explore. Tomorrow I hike the upper reaches--the part of the river laid bare before the open sky. What personality will it present? I can't wait to find out. Below is a map of the hike I accomplished today--a chunk of road walk followed by the five miles of trail among the Aucilla Sinks. There are links to many more photos. Great writing! Thanks for sharing your daily discoveries along the trail! Hope you're staying warm in this cooler and wet weather... But that the mosquitoes are not and maybe dying back a little for you.